About 20 years ago, I came up with a unique method of soap making that has bee scrutinized by soap makers all over the world. I use volume measurements instead of weighing ingredients to make my soap. The question is, can it be done so that you have the proper amounts of oils, lye, and water? The short answer is – no! All soap ingredients must be weighed in order to get the right amount of lye and water that will combine with a certain amount of oil to make it combine into soap. If weighed amounts are off, your soap can turn out lye-heavy and be harsh and drying, or it can be oil-heavy and turn out greasy and soft. So how did I come up with my recipe? I weighed all of the ingredients as I measured them out. I did this more than 100 times to be sure there would be no variations. The only thing I found was that on certain days, when there was more humidity, the lye would pick up moisture from the air and weigh differently – but this can happen with both weighed AND volume measured amounts. After doing this several times, and then checking it once a month or so (yes, I really do make that much soap! ), there has still been no variation in amounts over the past 20 years. I can assure you that my recipes using volume measurements will work in soap making, because they were originally weighed amounts. All of the ingredients are then blended and made into soap using the standard soap making practice, which you can see here: How to Make Soap. Another thing to keep in mind is that in weighing, it doesn’t matter if you have solid or liquid oils, they will weigh the same. But in volume soap making, the oils must always be liquid to measure correctly. Solid oils will not measure the same as liquid oils. This recipe is made using the same practice as above. What Can Go Wrong in Volume Soap Making? This is by far the biggest cause of problems. Always use distilled, filtered, or reverse osmosis water. Distilled and filtered water contains no minerals. Lye will attack the minerals in tap or well water, and there may not be enough remaining lye to react with the oils. This will result in a soft bar since the oil/lye ratio was thrown off. Rain water will work if it hasn’t been in contact with minerals on the way to being collected. Be sure measuring cups are on a flat surface while measuring. The product you are measuring must be level in your measuring cups. Always work quickly with lye so it doesn’t clump and throw off the measurement. When measuring lye, fill the cup, but do not heap or leave gaps on the sides of your measuring cup. This is very common in beginners because they are afraid of spilling the lye. Always melt your oils before measuring. Solid oils often contain air and will measure differently when using the volume method. Many oils can be used interchangeably with soybean oil, but some cannot. It takes a certain amount of lye to convert oils into soap. All oils have what is called a SAP value, which is this amount broken down into numbers. Find a chart of SAP values for most oils here. You should stay within 10 points of the original SAP of soybean oil when substituting another oil. This is about .135 for sodium hydroxide. The numbers will be different for potassium hydroxide, which is used to make liquid soap. Some good examples of substitutes would be sweet almond oil (SAP=.139), grapeseed oil (SAP=.135), lard (SAP=.138), or sunflower oil (SAP=.136). Some poor examples would be canola oil (.123) and jojoba oil (.066). Castor oil (.129) is on the border and would require just a bit less lye, maybe a teaspoon. As lye ages, it can become less potent and not work as well. Be sure to always use fresh lye, and keep it well sealed to keep moisture out. Can I Make My Own Soap Making Recipe? Figure out the ingredients you want to use. Run the list of ingredients through a lye calculator (like the one found here). Enter the oils you want to use and a lye calculator will calculate the amount of lye and water needed. It will usually suggest a range. You can choose the higher or lower, but I usually go right down the middle. After you have your recipe set, weigh out the ingredients, then transfer each one to measuring cups and record the amount of volume. This will be your new recipe. You might want to do the same thing, weigh and then measure, several times to be sure there is no variation in volume. If you change an oil, then recalculate, weigh, and then measure. I keep track of very recipe to be sure I have the right amount every time. If you want to stick with the original recipe and add some additional oil for extra moisture, this can be done at trace. For this recipe, because it is a small amount, add just a teaspoon or so, maybe as much as a tablespoon. More free oil that has not been used by the lye can cause rancidity. This is a good way to use castor oil or jojoba oil, which as base oils, need to be recalculated. 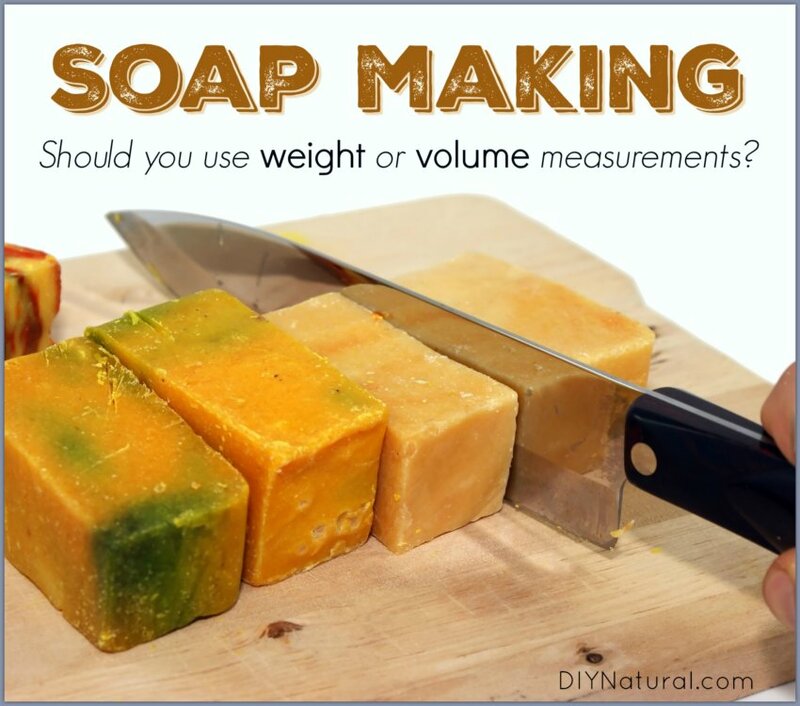 I hope I cleared up any confusion as to the weight vs. measurement debate in soap making! Have any questions? Ask below. we don’t use soybean oil. can that amount be divided and added to the coconut and olive oils. I make my soaps using this method because I was taught that way, I thought it was the only way! Today I learned something new. Thanks for sharing your recipe, I’ll try. Thanks Mar! I wish I had learned to do it this way in the beginning. It would have saved me so much time and effort. I do use it all the time now and have had a lot of success with it.